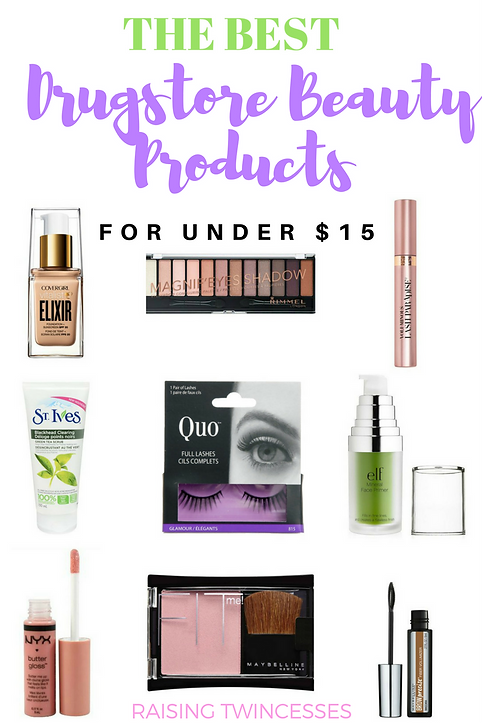 Over the past few weeks I’ve bought, tried, and loved a ton of drugstore beauty products, and also re-purchased a few old faves, all of which I thought I’d share with you today, ’cause who doesn’t love a great beauty buy? Elf primers are amaaazing! For someone with redness like me, I love the tone adjusting green because it helps reduce redness, but they all reduce pores, fill in fine lines, and smooth our your skin to help makeup go on smoothly and last! Holy Toledo! You guys, this foundation is sooo impressive! I typically wear high end foundation, but last week decided to buy this one to try out because my regular foundation is almost empty. I was curious to see if a $14 dollar foundation could hold up to my $50 one, and I was not disappointed in this one at all! It’s light, yet provides full coverage, lasts all day (with my primer), it isn’t oily, or drying, and as someone with super sensitive skin, I didn’t have any irritation. Plus, it comes in over a dozen shades! The only complaint I have is that the fragrance when first applying is SUPER strong. It smells good, a floral scent, but I am also super sensitive to fragrances, so I hated that. Once the foundation has dried the scent goes away, so for how well the foundation works, I’ll get over the fact that I can’t handle the smell when I first apply it. I’ve never really purchased drugstore blush, except one other in mt life, and I was pleasantly surprised with this one! I bought it on a whim when I saw it on sale for $4.50 (typically sells for $8). The shade is a very lovely pink color, that can be built up depending on how intense you like your blush. I love this blush for everyday wear, and have gotten so many compliments on it since I bought it! These are my go to lashes! I wear them for every big event/occasion, I even wore them on my wedding day! My sister-in-law introduced me to them over 5 years ago and I just picked up a few more pairs for the 3 weddings I have coming up! I also use the Quo glue, which has to be purchased separately, but it’s worth it, because it’s great!!! Because of my very sensitive skin I have a really hard time using facial scrubs. This is the only scrub that my face can handle, so I use it 2-3x a week! The ingredients are hypoallergenic, and the exfoliants are smaller than most scrubs I’ve tried, so they don’t irritate, or hurt your skin when using the scrub. I also like that it contains salicylic acid to help unclog pores and eliminate blackheads. This product shocked me. I fully expected to hate it, boy was I wrong! It gives brows more volume, definition and I love that the gel-like consistency keeps brows perfectly in place all day long. This is the perfect brow product for vacations and summer weather. As a blondie, I find the “blonde” wonderful, and I typically have a lot of trouble finding a brow product that isn’t brassy. I’ve been using this make up remover since the beginning of time! Well, since I was 13 anyway, so, basically FOREVER! I love it so darn much! It doesn’t smell bad, it doesn’t irritate eyes, and it takes off all your mascara and eye makeup! Winning! This is a pretty fantastic eye shadow palette for anyone who doesn’t want to fork over a ton of cash for the “Urban Decay Naked 3” palette! It has 12 very similar, pretty, pink and brown shades in both matte and shimmer, but for a fraction of the price. Bonus, the shadow stays put all day long! This is the perfect light pink lip gloss! It’s moisturizing, not sticky, applies evenly, and comes in so many different shades! It’s great solo, or added onto a lipstick for some extra glossiness! I’m such a fan of drugstore beauty products! I love that you don’t need to spend a lot of money to look like a million bucks! So tell me, what are some of your fave drugstore beauty products?